Pressing the Enlarge Display key (default: Register key 1) enlarges text on the Touch Panel. This function configures a screen layout focused on commonly used functions, enabling a user who has difficulty viewing the normal screen to easily perform operations. To return to the normal screen, press the Enlarge Display key again. If necessary, you can change or specify the default values of Enlarge Display. For details, refer to Here. If necessary, you can invert the color of the screen. For details, refer to Here. You can select whether to use Enlarge Display as the initial display of the Touch Panel (default: [No]). For details, refer to Here. In Enlarge Display mode, press the Menu key on the Control Panel to display the main menu. You can change from the main menu to each function or setting screen. Tap this button to display the main screen in the copy mode. For details, refer to Here. Tap this button to display the main screen in the scan/fax mode. Tap this button to display the main screen in the fax mode. The fax mode only provides fax functions of the functions that are available in the scan/fax mode. This mode allows you to quickly recall the target function when using a fax. The fax mode has the following features. Only fax destinations are displayed on the screen to enable destinations to be selected from the address book. Other types of destinations such as E-mail TX destinations are omitted from the list, so it is easy to find target fax destinations. 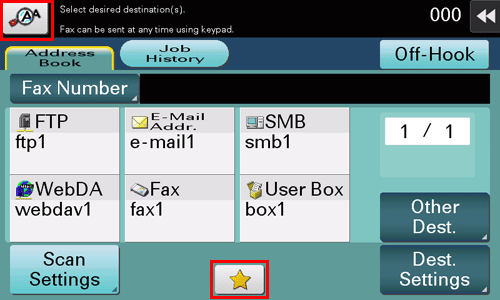 Only fax functions are displayed on the main screen or Application Setting screen. This makes it easier to search for fax setting functions. This manual describes fax operation procedures in the scan/fax mode. To use this function, the optional Fax Kit is required. Tap this button to configure the operating environment of the Control Panel, for example, by adjusting the Touch Panel or changing keying sounds. Tap this button to temporarily change the language to be displayed on the panel. This option is displayed when [Temporary Change Language Setting] is set to [ON]. For details, refer to Here. The total number of pages printed by this machine will be displayed while being summarized by each function. Tap this button to configure settings of this machine or check the use status of this machine. The following icons are displayed in Enlarge Display mode. Tap this icon to enlarge the message currently displayed. Indicates that there is a message related to a print error. Tap the icon to check the message and correct the error. Indicates that there are messages related to consumables replacement or device maintenance. Tap this icon to check the message and perform the relevant replacement or maintenance procedure. Tap this icon to recall the scan/fax program.